For thousand of years, silver has been admired for its beauty and durability. Before it was even used for jewelry, silver was used to make coins and silverware. These days it is mostly used for silver jewelry such as silver rings, silver earrings, silver bracelets, and silver necklaces. Pure silver is inherently soft and porous, making it prone to dents and tarnish. Regardless, this beautiful metal can be strengthened to allow for durable, long-lasting pieces. When it comes to sterling silver vs. fine silver, each has its own benefits. There are two main types of silver used to make jewelry: sterling silver vs. fine silver. Both types of silver originate from pure silver. As mentioned above, pure silver is soft and prone to damage. For this reason, other metals are added to the silver to increase durability, strength, and resistance to tarnishing. Sterling silver is an alloy, meaning it is mixed with other metals in addition to silver. Typically, copper is the metal added to create an alloy. In addition, other metals such as zinc, platinum, and boron can be mixed to create the alloy. An alloy must contain at least 92.5% silver to be considered sterling silver. The other metals are what comprise the remaining 7.5%. It is common to see a .925 stamp on sterling silver jewelry, such as on the inside of a silver ring band. This stamp is essential to indicating the authenticity of the given sterling silver piece. 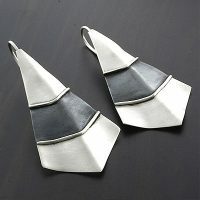 Although .925 sterling silver is the most common type of silver used in jewelry, it is not the only type. Fine silver is 99.9% pure silver, and is marked with a .999 stamp. Jewelry made with fine silver must be treated with great care since it is soft and prone to bending or breaking. Fine silver only has 1/10th of one percent of another metal combined with it to add strength. For this reason, fine silver jewelry pieces can easily be scratched and dented. When comparing sterling silver vs. fine silver, it is clear to see that sterling silver jewelry is the much more practical option. It is more durable, more shiny, and more resistant to tarnishing. Sterling silver is a great material for long-lasting jewelry that is also affordable. Fine silver, on the other hand, looks beautiful and antique, but is not as easy to care for and may not last for years to come.